Lunchbox Chickpea Salad is naturally gluten-free, vegan, and very flexible. It requires a bowl, 10 minutes, and you will have lunch for days! I hope you are well fed and over rested to tackle Monday. If you have a holiday today, please continue to do that while some of us have to be back at work. My weekend was lovely - full of love, good food, and catching up with friends and family. Generally, I dedicate Sunday for meal planning but when that does not happen, I have a few recipes in my back pocket that saves the day. One of those recipes is Lunchbox Chickpea Salad, which can be made by anyone, anytime, anywhere as there is no cooking involved, only chopping and mixing of ingredients. If you are looking for a quick lunchbox idea for you and your loved ones - this is a good one to try and customize it to fit your needs. It's no surprise that I love chickpeas..how do you not? It is delicious//nutritious//inexpensive//super versatile (case in point: hummus, soup, sandwich) so I try to use it as often as I can. If chickpeas are not your thing, you can most certainly swap with other beans such as cannellini, Navy or Great Northern beans. For veggies, I use a handful of whatever fresh veggies & herbs I have one hand. Lunchbox Chickpea Salad is one of those recipes I don't mind eating on repeat for days - there's a nice texture from chickpeas and veggies, olives adds saltiness, while parsley keeps things refreshing. You could also bulk up the salad by adding cooked grains such as quinoa, barley, freekeh etc and adjust other ingredients as needed. The forgiving, flexible Lunchbox Chickpea Salad doesn't ask for much but a simple dressing is a must in order to marry all the ingredients together. So, if you are one of those people who are bored with cafeteria lunch, don't want to spend $$$ eating out, want to explore a meatless option, or just want a damn good easy salad for lunch - this one is for you! 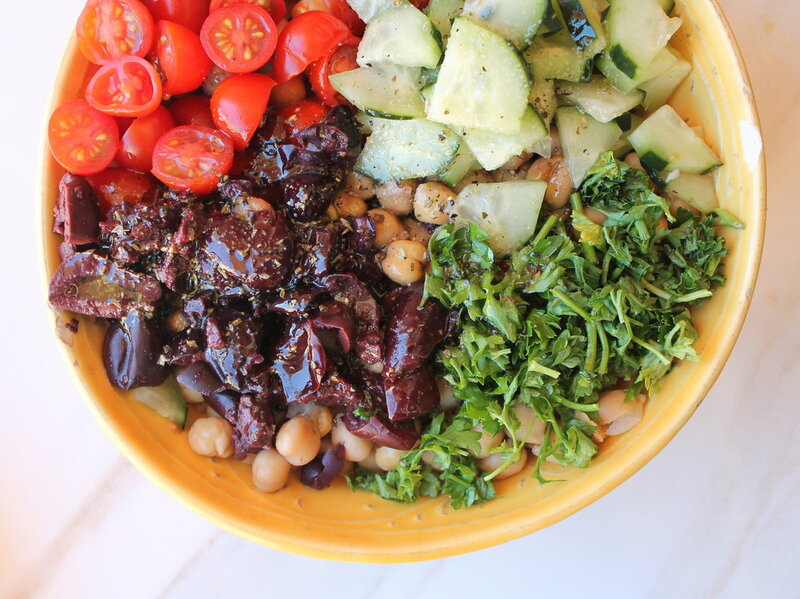 I hope you get inspired by my Lunchbox Chickpea Salad and make it part of your lunchbox too! In a large bowl, combine chickpeas, cucumber, tomatoes, olives, and parsley. Slowly drizzle olive oil, vinegar, Italian seasoning, salt, pepper and combine everything together. Store it in the refrigerator in an airtight container for 4-6 days. You can mix the ingredients for the dressing separately and drizzle over it if you don't mind washing an extra bowl! Tell me about your Valentine's Day weekend...Ours involved catching up with friends for brunch, rescuing a stray dog, and eating chocolate roll cake & leftover butternut squash soup.